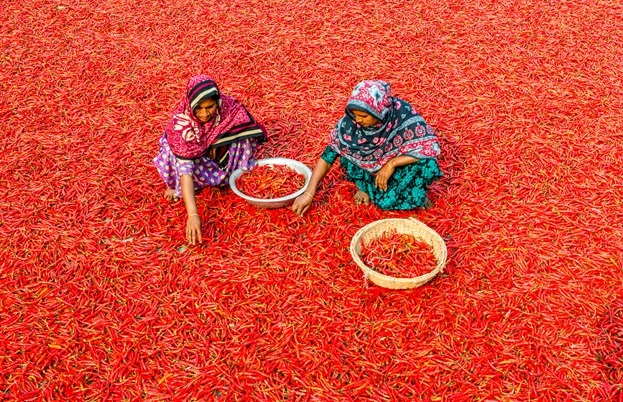 Dina Begum introduces us to the food of Bangladesh – an often misunderstood and under-appreciated cuisine in the UK – and shares six iconic recipes from the country that best represent its seasonal approach to cooking. Shoro Ritur Desh (‘the land of six seasons’) was first introduced to me as a child during my Bengali classes after school. 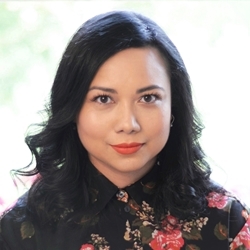 Having left Bangladesh at the age of four for London, I remembered very little of the country of my birth and was fascinated by the food-centric seasons illustrated in my textbooks. Scenes of men and women carrying baskets of fruits and vegetables against the backdrop of village life; farmers knee-deep in rice paddy fields; fishermen with their nets cast wide, captured mid-air over lakes, and children picking fruit from trees. These were the scenes which best reflected to me the food of Bangladesh. Formerly part of India and then known as East Pakistan after the partition of India in 1947, Bangladesh is a fairly new country that gained independence in 1971. Steeped in a rich food history and influenced by Persian, Mughal and Southeast Asian cooking, Bangladeshi cuisine is markedly distinct from both Indian and Pakistani food. Although there are many shared recipes with neighbouring West Bengal (people are called Bengalis in both areas), there are distinct flavour differences which makes Bangladeshi Bengali food unique from Indian Bengali food across the border. The staple grain of this largely agricultural country is rice, both in cultivation and consumption, and due to its many waterways there’s an abundance of fish and seafood. ‘Maach e Bhaat e Bangali’ is a popular saying which loosely translates as ‘fish and rice make a Bengali’, a phrase which reflects the vast range of rice- and fish-based dishes eaten across the country. Rice is simply boiled or steamed and forms the basis of everyday eating. Bread is less common; fried, puffed luchi, similar to whole wheat Indian puri, is made of refined wheat flour, reserved for breakfasts and special occasions. There is an emphasis on fresh, seasonal fruit and vegetables which are incorporated into meals, with the majority of fish and meat dishes cooked with them, as opposed to being served alongside each other. 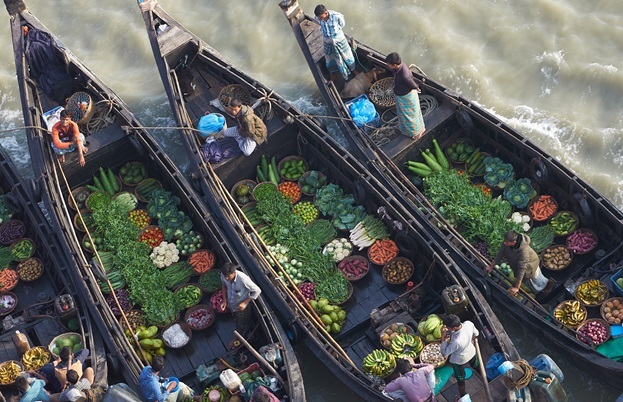 Bangladeshi food is influenced by its geography as well as local traditions. The capital Dhaka is known for street food and fragrant rice dishes such as tehari, a pulao cooked with beef, mustard oil and whole green chillies. This cuisine is rooted in Mughal traditions and cooking methods famous for milk, yoghurt and nut-based dishes such as chicken rezala, which is similar to a korma, and nargisi kofta – mince-wrapped eggs in gravy. Sylhet favours fiery curries made with pastes of fresh and dried chillies, roots and spices. Dried and fermented fish called shutki are used in vegetable broths and dry dishes. Shatkora, a bitter and fragrant citrus fruit, as well as the extremely hot naga chilli, also form part of the local diet. Chittagong, which is bordered by Myanmar, includes many Southeast Asian flavours such as dried fish and bamboo shoots. Slow-cooked beef dishes shape feasts and celebrations. In Khulna, shellfish such as crabs, prawns and lobsters are popular, owing to the region’s proximity to the mangrove forest of the Sundarbans. The abundance of coconut trees in this part of the country means many recipes, both sweet and savoury, feature coconut. Rajshahi and Rangpur specialise in fruit and vegetable dishes such as shak (a leafy vegetable stir-fry) and stews. Six seasons (summer, monsoon, autumn, late autumn, winter and spring) inform the rich and varied food of Bangladesh. Each two-month season is celebrated with music, dance and food festivals which inevitably showcase a special range of dishes as well as everyday staples. Bangladesh is known for its extensive selection of desserts, and a meal or get-together is incomplete without something sweet. There’s mishti doi (sweet yoghurt), all manner of milk-based mishti (sweetmeats) and fried, baked and syrup-soaked pitha (rice cakes) enjoyed during winter. Summer is a celebration of fruits such as mangoes, jackfruit and jaam – damson-purple stone fruits that stain your hands as you eat them. This is also the season when the largest festival in Bangladesh (Pohela Boishak) takes place, to usher in the Bangla New Year. Pantha bhaat (overnight fermented rice) is eaten with bhortas – a mash made with vegetables or fish and mixed with onions, chillies and mustard oil – and fried Ilish (or Hilsa), Bangladesh’s national fish. Food during the monsoon season tends to emphasise comfort, and brings on an excuse to share Cha Nasta – the quintessential Bangladeshi tradition of taking tea with snacks, similar to the British afternoon tea. Sweet and savoury snacks are enjoyed, in particular indulgent fried foods. These include fritters made with onions called peyaji and beguni, which are made with aubergine. The sound of heavy rain always brings back memories of our family home in rural Sylhet; enjoying steaming cups of sweet dhood cha (spiced milk tea) with plates of nasta (snacks), sitting on the veranda, listening to the sound of the monsoon rain. Autumn means feasting season has begun. Weddings are where you’ll find rich Moghul-inspired food such as aromatic biryanis and pulaos, slow-cooked meat dishes and sweets such as firni – a softly set pudding made with ground rice. One of my favourite Bangladeshi celebratory dishes is biye barir roast (or wedding roast): meltingly soft chicken, fried and cooked in a mildly spiced caramelised onion gravy. I loved this the most in Bangladesh when it was cooked over an open wood fire stove by baburchis (chefs) during my aunt’s wedding. As autumn shifts into late autumn, Nabanna, meaning ‘new crop’, marks the winter harvest. Cooking and eating is shaped by rice in all its glory (puffed, ground, broken and flattened), ready to be transformed into delicious dishes. The special tradition of pitha – rice-based sweets and savouries (of which there are literally hundreds!) – takes centre stage and includes fried turmeric and ginger discs called nooner bora, patishapta pitha, (stuffed rice crêpes) and chitol pitha (Bangladeshi crumpets). My mother makes colanders of spherical steamed rice dumplings called choi pitha, which are a family favourite eaten with a light lamb or beef stew, or simply dipped in ghee or molasses straight out of the steamer. One particular pleasure of winter is morcha gur (date molasses). Clay pots hang overnight on date palms to collect the dripping sap early in the morning, which is then simmered and poured into pots as a rich date syrup or set into various types of solid molasses. In England gur is imported by specialist Bangladeshi shops at certain times of the year and eagerly anticipated by the cooks in my family to make the much-loved handesh – fried rice flour and molasses cakes. Shatkoras are cooked in beef curries and fish stews. Winter gourds, such as kerela (bitter gourd) are sautéed with onions and chillies. Lush yellow mustard fields in the spring mean pungent mustard seeds are added to dishes as an individual spice, or intensified to form the classic Bangla five-spice blend called panch phoron; a mix of mustard, fennel, fenugreek, cumin and nigella (onion) seeds. This spice imparts a distinct burst of flavour when dropped in hot oil at the beginning of cooking, a great addition to vegetable dishes called niramisha which are essential to Bangladeshi home cooking. Bhortas (fish and vegetable mash) are in good company during this time, with mustard oil at its freshest along with delicious spring produce. Mustard greens are a favourite during spring and leafy greens or vibrant purple amaranth are sautéed with chillies and garlic into dishes called shak. My selection of Bangladeshi recipes reflect only a small proportion of the rich and diverse food heritage of Bangladesh. 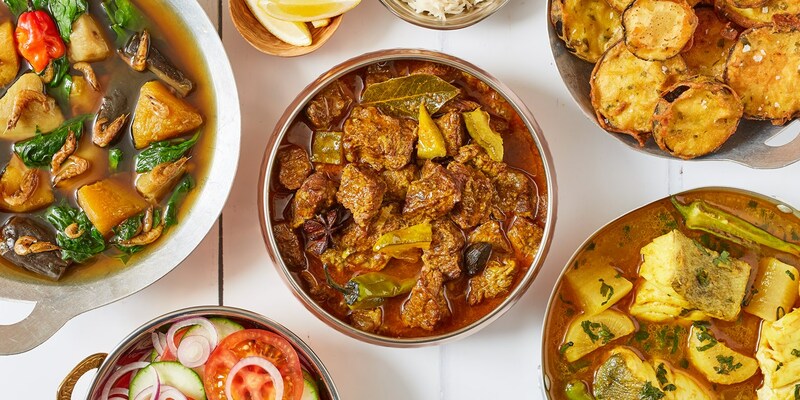 These are the dishes that cannot be found in restaurants and represent a cuisine often misunderstood in the UK, as high street curry houses are often run by Bangladeshis but their food is not reflected in their menus. While Bangladeshis in the UK are some of the pioneers of what was then generically known as ‘Indian food’, the beloved and authentic food of Bangladesh is found in homes, usually cooked by women. These recipes are passed from generation to generation though observing and cooking, rarely written down and using the best tool in the Bangladeshi kitchen – antaaz, or estimation.